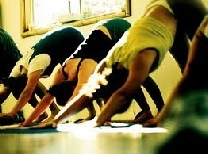 A typical class: Starts with seated breath-based arriving pra ctice; simple warm-up exercises using movement with breath awareness; progresses to include a mixture of classic postures (asanas) for whole body stretching and balancing; closing with relaxation, breathing practices (pranayama), mantra and 10- 20 minutes guided mindfulness/silent sitting-meditation practice. Lindi has been practising yoga for over 30 years, influenced and encouraged by Joan Ponton, she went on to train with Swami Satchidananda Ma and qualified as a Teacher with the British Wheel of Yoga in 1999. Over the past 20 years Lindi has been teaching individuals and groups privately and through Adult Education, Schools, Social Services and Prisons. The classes have included mixed groups, men, women, children, young adults with special needs, and, with the Prison Phoenix Trust, in a Therapeutic Community, Young Offenders Institute and Prisons. Read more about Lindi ….. It is better not to eat a meal within 4 hours of the class starting (2 hours if just a snack!). You may like to bring drinking water into the class. Please complete the confidential Health Questionnaire in advance, advise Lindi of relevant physical/mental health concerns and consult your doctor/health practitioner if you have any concerns.